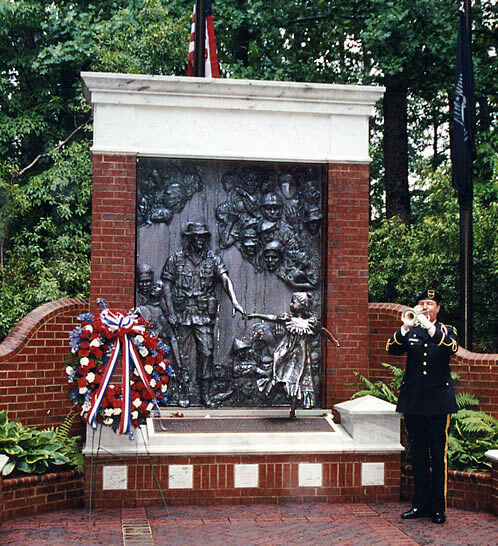 The Roswell Vietnam War Monument is fourteen feet in height and twenty feet across, highlighted by Georgia marble cap stones and old colonial bricks. The plaza and walkways contain hundreds of memorial bricks purchased by supporters of the project. Fifty faces, cast in bronze, depict an array of emotions, including fear, grief, and courage. They represent American serviceman and women, medical personnel, and Vietnamese civilians. One figure in the sculpture is that of a soldier reaching out to clasp the hand of a little girl. A sheer waterfall cascades over the backdrop faces. Viewers will be able to see a reflection of their own faces and at that instant become a part of the memorial. As you visit the Memorial, remember those who served to protect the sovereignty of our country, not only in the Vietnam War but in all wars, and their families. And emerging from the Faces, one soldier stepping toward the future into a garden – Stepping toward the next generation a child – His legacy and ours.